‘These cryptic stones are my life. I want to get the secret of them or find at least a little of it. What are these lonely rings? Where are we standing now? In a place of worship, where men prayed to the thunder and the sun and stars? Or a council chamber? Or a court of justice that has seen many a doom pronounced, much red blood flow? Or is it a grave? Tis the fashion to reject the notion that they represent any religious purpose; yet I cannot see any argument against the theory. I go on peeping and prying after a spark of truth. I probe here (Scorhill Circle), and in the fallen circle yonder towards Cosdon; I follow the stone rows to Fernworthy; I trudge again and again to the Grey Wethers – that shattered double ring on Sittaford Tor. I eat them up with my eyes and re-people the heath with those who raised them. Some day a gleam of light may come. And if it does, it will reach me through deep study on those stone men of old.‘, (Phillpotts, 1903, pp. 281 -282). ‘The Gidleigh circle consisting of stones, which are for the most part pointed, presents a very different aspect from the Grey Wethers. They are thirty-seven in number, ten of which are fallen. The highest of those in their original position, is eight feet above the ground; the medium height of the largest number is about four feet and a half, the smallest stone is three feet. Diameter of the circle, ninety feet.’, (Rowe, 1830, p.183). Of all the Dartmoor stone circles Scorhill is probably the least prominent in the moorland landscape yet when comparing the actual sizes of stones it must be the most impressive. Today the circle can boast 23 standing granite stones and 11 fallen stones which form a circle with a diameter of 27 metres, the stones vary in height from 2.49m to 0.85m and are set roughly at intervals ranging from 0.6m to 0.9m. The consensus of opinion amongst the experts is that originally Scorhill Circle comprised of around about 70 standing stones, this would have made it the largest (as far as stone numbers go) stone circle on Dartmoor, although that is not the case today. Sadly the circle has suffered at the hands of modern man and the despoiler as is evident from the damaged stones that lie in its vicinity. Butler, (1991, p.192) explains how several stones pertaining to the circle show marks left by the stone cutters, the large slab numbered 1 on the site plan opposite shows a clear row of jumper holes down its centre. The stone cutter would make such a line of holes and then force a wedge (known as a ‘jumper’) into each one, this resulted into the stone being split in two. A similar fate literally befell the huge slab which lies to the south of the circle (numbered 4 on the site plan), this too sports a neat row of jumper holes along its base. There is also the possibility that the nearby Gidleigh Leat has benefited from some repair work involving some of the circles’ stones. The other man-made scar slashed across the circle are the tracks made by countless feet over the centuries. At first these would have been made by travellers using the circle as a waypoint leading towards the two fords below, as the older and deeper ruts testify. Just why some of these ancient tracks insist on ploughing through prehistoric monuments is a mystery. Maybe the travellers of old nurtured an impulse to get close to the stones, just as many of use have a magnetic draw to them today? However, latterly people visiting the circle have worn such a deep track around its perimeter that it is visible on Google Earth from an altitude of at least 39,737 feet. It is interesting to note from Google Earth’s aerial view that the favourite line of approach to the circle is along the Gidleigh lane, through Berrydown Stroll onto the open moor and then across to the circle. S. Rowe 1848 20 not stated 0 ? S. Omerod 1858 29 2 51 ? Murray 1865 26 6 55 ? Spence Bate 1876 29 2 0 ? Lukis & Andrews 1879 24 8 0 ? Brooking Rowe 1896 24 8 52 ? As can be seen, the number of standing stones has varied from about 30 to 20 and the number of fallen stones 2 to 11. Either the stones are giving it some Dartmoor Rock and dancing around or that phenomenon of stone tallies has kicked in. When I last visited I managed a tally of 23 standing and 11 fallen which seems to be about what the modern thinking is. Obviously some of the stones will have fallen since the early 1800s, Butler, (p.192) cites the stone labelled 2 on the site plan as falling down about 1891 so there is one excuse for some of the tallies. Others, as mentioned before will have been ‘recycled’ for wall building etc whilst in some cases other will have become overgrown with vegetation or sunk further into the peat. Nevertheless, an interesting exercise to show how peoples perceptions vary. As can be seen from the site plan opposite, the stone circle is not the only prehistoric feature in the vicinity, there is evidence of at least 6 known hut circles along with 3 cairns which show signs of being visited by treasure seeking tomb raiders sometime in the past. If one extends their focus further than around the circle it soon becomes obvious that this area is but a small part in a vast prehistoric landscape which encompasses many settlements, cairns, stone rows, menhirs, reaves and other stone circles. A large collection of flint artefacts have been found on Gidleigh Moor (donated to the Torquay museum) which range in date from the Mesolithic (middle stone age, 8,500 – 4000BC) to the Bronze Age (2,300 – 700BC). This clearly shows a long time span of occupation and land use, be it hunting/gathering or indeed farming and settlement. In this north eastern sector of Dartmoor there is a cluster of 8 stone circles whose locations for a ‘sacred crescent‘ when plotted on the map and Scorhill sits in the middle of these. Moving on from the realms of probable it’s now time to venture down the path of plausible, it has been said (Hayward, 1991, p.65) than at about 10 pm on midsummer’s eve the sun sets behind the tallest of the standing stones at Scorhill. This may well demonstrate some purposeful astro-archaeological intent and support the calendar theory. Having dipped one’s toe in the pool of plausible it is then possible to dive into the pond of slightly perverted. Burl, (2000. p.153) ventures that the reason the tallest of Scorhill’s stones was chosen is due to presence of natural, ‘geological bosses, amygdales, almond-shaped cavities bulbous with crystals.’ These are about 5 cm wide and protrude for about 2 cm and can be found on the inner face of the stone according to Burl, they represent women’s breasts and can be deemed ‘illusionary art‘? Sorry, but if one looks hard enough Dartmoor it littered with rocks and that will provide enough provocative sexual images/symbols to put Soho to shame. Having moved from probable to plausible to perverted it’s now time to enter ‘woo woo’ land. Scorhill circle is part of the story of the ‘Faithless Wives of Chagford‘ with the nearby Tolmen Stone and the Grey Wethers. Additionally there is the tradition that the circle was said to have been the home of fierce ogre who had a passion for sheep and any that strayed near would be killed, butchered and eaten. But most of the folklore attached to the circle seems to stem from the modern era, for example there are several reports of horse riders who can never get their horses to go through the circle. The circle was said to have been the home of fierce ogre who had a passion for sheep and any that strayed near would be killed, butchered and eaten. Although not a ‘legend’ I have included this site because of a personal experience in 1996. On a hot summers day I was passing the circle and stopped for drink when I noticed a adder slithering across the circle. When it reached the edge it appeared to have met an invisible wall because try as it might it just could not pass out of the circle no matter where it attempted to cross. The snake seemed totally disorientated and lost. In the end with the aid of my stick I gave it a helping hand and it soon took off skyward to the safety of the nearby tussocks. A modern happening reported in 1998 was that a small herd of moorland ponies were seen to walk up to the circle. The herd leader entered the ring of stones and stood there for about a minute, it then rejoined the rest of the ponies. One by one all the ponies did the same thing, went into the circle stood there for 30 – 60 seconds and the came out. All the animals faced the same direction whilst they were stood in the stone ring. It was suggested at the time that the ponies were ‘taking energy’ from the stones – who knows? A story which possibly reinforces the ‘natural energy’ theory is that of a lady who for six and a half years had suffered with a swelling in the knee. This made walking difficult to say the least. Many doctors had examined the joint but none were able to solve the problem. 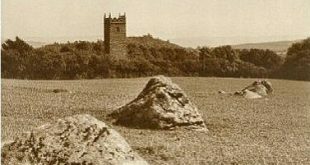 Living in the Chagford area the woman was aware of the stories relating to Scorhill circle, so one day she made a slow and painful trip up to the stones. Having sat inside the circle for a while she then made her way back, by the time she had reached Scorhill Gate the swelling had reduced by 50%. By and by the ability to walk soon returned and the swelling has caused few problems ever since. If you take the route from Batworthy to Scorhill circle it is worth taking a slight detour up onto Chagford common. For there you will see in a field beside the wall another stone circle. I first noticed this last year and was puzzled to say the least. I had never read of this stone circle or seen it on any map and it transpires that it is a modern circle built a few years ago by the landowner. As shown opposite, the circle looks very authentic and could easily be mistaken for a Bronze Age construction. I wonder how long before this circle earns itself a legend? Burl, A. 2000. The Stone Circles of Britain, Ireland and Brittany, London: Yale University Press. Burnard, R. 1986. Dartmoor Pictorial Records, Exeter: Devon Books. Falcon, T. A. 1900. Dartmoor Illustrated, Exeter: James G. Commin. Hayward, J. 1991. Dartmoor 365, Exeter: Curlew Publications. Page, J. Ll. W. 1895. An Exploration of Dartmoor, London: Seeley & Co. Ltd.
Phillpotts, E. 1903. Children of the Mist, London: Methuen & Co.
I’m very interested in stone circles and have just started to look at those on Dartmoor. At present, from the data here, it looks like this circle has an odd number of stones. That would make ‘regular’ setting-out difficult. Have any soundings been taken for post sockets? That could resolve matters.